Cheapest/Quickest option for flight to Marshall Islands from Bangkok? I'm planning a trip to the Marshall Islands from Bangkok. My usually travel sites like Skyscanner and KAYAK are not helpful, showing flights either $5,000+ or unavailable. Does anyone know what my best option would be? Where should I book the layover? Flying from a major destination, like Bangkok, to a remote location, like the Marshall Islands, is not something that works easily punched into a flight search website. You really need to research the trip from back to front. Who flies to the Marshall Islands and from where. Once you sort this out, figure out which are the bigger airports with the most flight options (Guam, Honolulu). 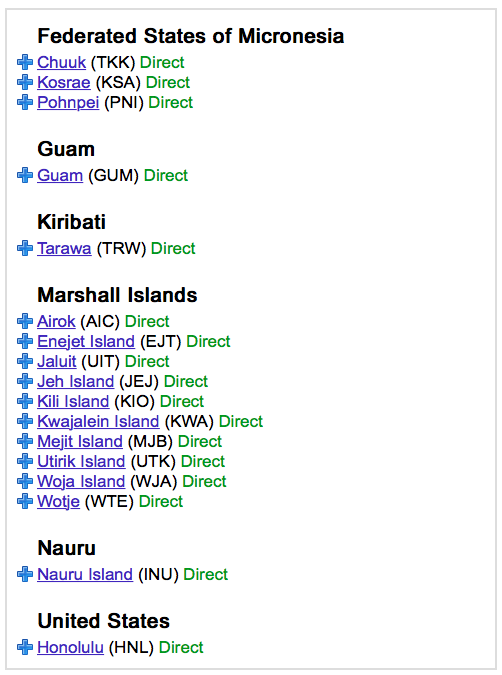 Then look at flight schedules and prices from these airports to Marshall Islands. Now you know when to arrive, so start looking for flights from Bangkok to Guam or Honolulu that arrive in time to make your connections and keep the wallet happy. The Marshalls are tiny and remote, and consequently flight connections (specifically, to Majuro, the only airport of any size) are extremely limited. Getting there from Bangkok will involve at least two hops. The only two airports with longer-distance connections to Majuro are Guam (GUM) and Honolulu (HNL). Your least bad option will thus likely involve flying to Tokyo or maybe Seoul (both well connected on LCCs like Air Asia), then continuing via GUM/HNL; Rome2Rio claims to have Tokyo-Majuro flights for as little as $900. United flies 3 times a week non-stop from Honolulu<->Majuro. That's about $1500,- round trip. BKK <-> HNL round trip will run you about $1000 (ANA in January) and as little as $750 if you are willing to deal with crappy routing on Korean. So you should be able to do this for $2500 or less, but you need to buy two separate tickets and make sure you select the non-stop dates for the HNL<->MAJ legs. Tip: great website for "who flies where when": www.flightconnections.com. Just click on the destination and all scheduled routes pop up. TL;DR About $2000, and Brisbane! we see that there is a direct flight to Nauru, and checking the flight number for that clues us in that Nauru Airlines has bookable Brisbane-Majuro flights. That sets our stopover at Brisbane, which makes further research trivial, Thai has nonstop daily flights for starters. There is a island hopper flying between Guam and Honolulu 3 times per week (in each direction). This flight stops in the Marshall Islands and a few other places (Chuuk, Pohnpei etc). I went to Pohnpei last year on this flight and it is a rather straightforward flight, the airplane is actually a Boeing 737 (would have expected something smaller). Flight numbers UA154 and UA155 if my memory serves me right. One very important thing to be aware of is that although you might not have any plans of leaving the airport at Guam, you need a visa/ESTA for the US! You also need to pick up your luggage and check it in again, which also means that you have to follow US regulations and treat the trip as if your final destination was the US. When it comes to prices and flight times there really are no ways of getting around this. As for booking the flights I did it through a travel agent since we took this flight as a part of an around the world trip. However, I would consider doing the same even if you are justing going to the Marshall Islands, simply because it is such a rare flight to book and having an experienced travel agent that can find the best combination with other flights and assist if anything goes wrong is very good to have. It is going to be a costly trip anyway, so spending that little extra is something I view as a good investment. As to where to book the layover you are really limited by when the island hopper flights are going. Most likely you have to make this layover in Guam whether you want to or not. The airport is open 24/7, so you can sleep on the floor if you want or book a hotel in the city. Although the airport is open all the time the check-in counters are not, so make sure to check when you can drop off your luggage. We decided to do it before they closed in the evening, went down to the city (taxies are available, possible to walk around 4 km if you really want to save a few $) and came back close to midnight to sleep in the terminal. Not the answer you're looking for? Browse other questions tagged air-travel bangkok marshall-islands or ask your own question. What's the closest SCUBA spot to Chiang Mai? Why do flight search engines give inconsistent results? How flexible are around the world tickets regarding flight dates? Which websites allow “search by country” for a flight?